The Sentry Ultrasonic Cleaner XL is a high efficiency cleaner specially developed to clean surgical instruments. The Sentry Ultrasonic Cleaner XL is a quick and effective way to clean lab tools: Ultrasonic waves pump micron-sized bubbles into the water. These bubbles fit into the tightest spaces that would be impossible to clean by traditional methods. When the bubbles implode, water hits the instrument at speeds up to 250 mph—a very powerful cleaning action. A digital control panel simplifies operations . Cleaning cycles are preset and optimized for the most efficient cleaning of your surgical instruments. The Sentry Ultrasonic Cleaner uses a powerful generator to create ultrasonic waves that provide effective cleaning action in most cases. When heavy bioburden or oily residue is present, the Sentry's cleaning power can be enhanced with its heating feature that warms water up to 65. The elongated tank easily accommodates long surgical instruments or other lab equipment that may not fit into smaller desktop ultrasonic cleaners. 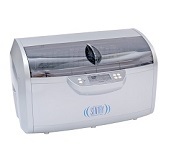 The Sentry Ultrasonic Cleaner will work quietly without disrupting work in the laboratory. The tank has a lid to decreases noise; the viewing window allows the user to monitor progress. This compact cleaner takes up little space for convenient storage on the bench. Its light weight makes for easy transport to a different location or for storage if bench space needs to be cleared. * Warning: Ultrasonic sound waves emitted by this cleaner may disturb laboratory animals. Tank Size: 32.3 x 20.5 x 9.9cm; 12.7 L x 8.1 x 3.9 H in.